Sometimes our prayers flow easily, and we talk to God just as naturally as we would to a dear friend. But sometimes we can't find words to express our thoughts, no matter how hard we try. What can you do when you can't pray, or when you need a prayer for a specific occasion but don't know where to begin? You can turn to the prayers of other Christians to carry you into God's presence. Prayers for Life's Ordinary and Extraordinary Moments is a unique collection of prayers that give you words to pray in those times when you can't find words of your own. 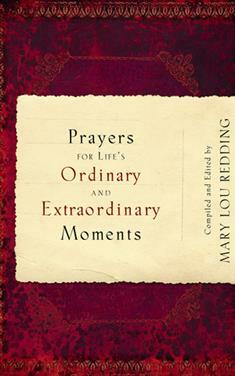 "Being able to pray is a privilege and a gift," Mary Lou Redding writes. "This collection is a gift to us for the times we need someone to help us say what we want to say to God." Through this book, you will learn how to touch the heart of God when you can't articulate your own prayers.